UP Jagran Public School Recruitment 2019 Contact to Jagran Public School New Jobs Opening in branch of JPS Varanasi Teaching Staff Jobs, Kannauj, Lucknow and Jagran Public School Noida Recruitment 2019. 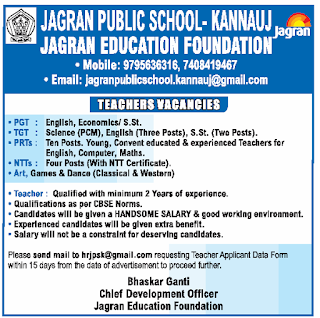 Jagran Public School Kannauj Recruitment 2019: Jagran Public School is English medium school that attracts Parents to make their children as education topper not only in English speaking but from all side. 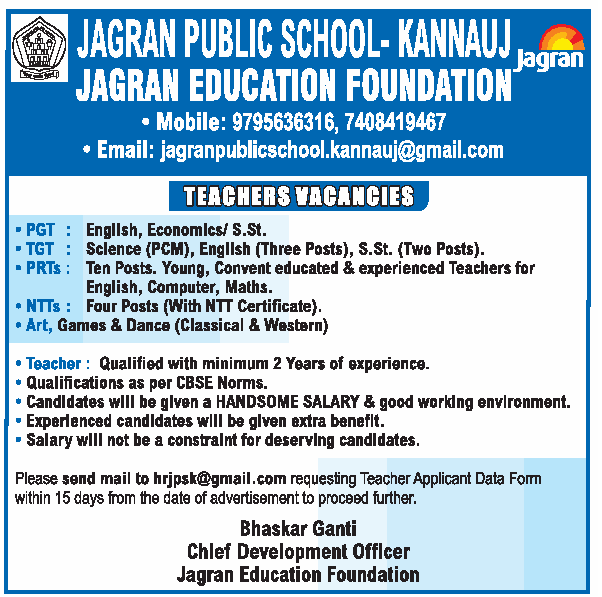 Jagran Public School recently invited Teaching and Non Teaching Staff on Permanent basis (based on profile) in the TGT Primary Teacher, Nursery Teacher for More details you may check below on Dainik Jagran Public School Latest Jobs. Location: Jagran Public School, Kannauj. Name of the Posts: Teaching Jobs in English Medium JPS School. Total Number of Vacancies: 2 Hindi TGT, 2 Maths TGT, 5 English TGT,2 Science TGT, 10 PRT’s, 5 NTT’s , 3 Games Teachers. Pay Scale: Salary of Teacher in Jagran Public School will be teaching with attractive package. Detailed Qualification: As per CBSE Norms. PGT: English, Economic & Social Studies. Primary Teachers: Ten Posts (Young Convent Educated & Experience Teachers for English computer & Maths). Nursery Teacher Training: 4 posts (with NTT Certificates). Arts (Games & Dance), (Classical & Western). Eligibility Criteria: Preference given to those who qualified with 2 years of experience. Candidates will be given handsome salary with good working environment. Experience candidates will be given extra benefits. Salary will not be constraint for deserving candidates. How to apply: interested and eligible candidates should send mail to hrjpsk@gmail.com requesting teacher application form within 15 days of advertisement to proceed further. Source: Bhaskar Ganti, Child Development Officer, Jagran Education Foundation.